Global demand has matched the considerable hype that nanotechnology has generated over the past decade and a half, nanomaterials have managed to attain an appreciable commercial presence in recent years. Global nanomaterial demand will continue to rise, posting robust 21 percent annual gains to $3.6 billion in 2013. By 2025, Global demand for nanomaterials is expected to reach over $34 billion in sales. In 2014, the US and Japan combined to account for over half of Nanoshel nanomaterial demand, while Western Europe and two high-income Asian nations, Taiwan and South Korea, represented an additional 34 percent. While virtually all nanomaterial markets will experience robust double-digit gains in demand, the fastest gains are forecast for the rapidly industrializing countries of China and India. By 2025, it is expected that China will rise to overtake Japan as the second largest market for nanomaterials in the world behind the United States, accounting for twelve percent of global demand. 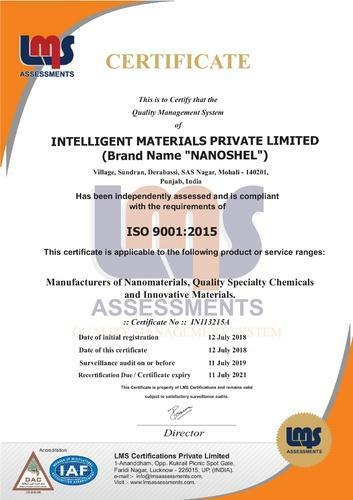 This certificate is applicable to the following product or service ranges:Manufacturers of Nanomaterials, Quality Specialty Chemicalsand Innovative Materials.